A cover letter is a backup document that introduces your resume. It acts as a summary of your resume. As a job applicant, it’s essential to note that, your potential employer will be motivated to read your resume based on how you have crafted your covering letter. Because of the significance of the letter as part of job application documents, you must be keen to present be best ‘you.’ A template will work wonders to help you write a professional cover letter. Write a cover letter for each job. Show how you can solve the employer’s problems. Speak directly to the hiring manager. Be unique from other applicants. Proofread the cover letter for mistakes. You can rely on samples/templates to write a cover letter. But remember, even if you are using a sample, you must tailor your cover letter to the specific job you are applying for. 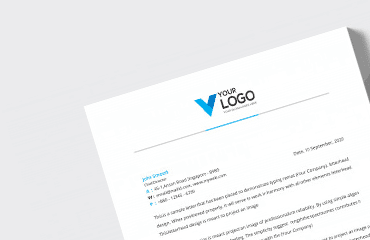 The sample should only act as a guide to offer the format and guidelines of what to include in the letter. The letter must begin with your contacts, date and employers contacts. If you are writing the letter in the form of an email, your contact details should feature at the end after your signature. Start the cover letter with salutation Dr./Mr./Mrs./ MS./ Sir/madam followed by their last name. If the last name is not available use the tag ‘Dear Hiring Manager.’ Avoiding the phrase ‘To Whom It May Concern,’ it appears too generic. Your introduction must aim to capture the attention of the reader. Start by informing them how you knew about the position after stating the specific position and then explain what makes you fit for the said position. In this section, use a paragraph or two to match your skills and experience to the job. Avoid vague statements when explaining your suitability for the position. Words like, ‘I am aggressive,’ ‘goal-oriented,’ ‘focused,’ ‘team worker,’ etc. must be backed by specific examples in your current or former positions to make them meaningful. As you conclude the writing the cover letter, restate why you believe you are the best candidate for the position and what you can offer to the company. The best way to end the letter is a call to action. Remind the hiring manager your desire to work for the company and a request for a chance to discuss more in an interview. Thank them, for the opportunity. At the end of your cover letter include a complimentary close followed by your handwritten signature and your official names. As an enthusiast of program management, I was excited to discover your advert for a program manager in your company at indeed.com. My experience at Leads international and Saviors Corps as a program manager groomed me to be one of the best in the industry. At both companies, I have implemented several programs that have been a considerable success in environmental conservation and food security. My seven years of service as a program manager has helped me to develop excellent skills in program planning, implementation, and evaluation. I believe these skills will be a useful asset for your upcoming projects. Besides, I will be earning my master’s degree in monitoring and evaluation by the end of this year. The knowledge acquired from this course will add to the skills and experience I have in this field. I will be delighted to discuss more on what I can offer for your upcoming projects by utilizing my skills and experience. Once more than you for the opportunity, I am waiting to hear from you soon.